Thank you for your interest in Most Valuable Kids of Greater Cincinnati, Inc. and for helping to reward and inspire deserving kids in our community. MVK is now a part of the Kroger Community Rewards Program! Visit https://www.kroger.com/account/enrollCommunityRewardsNow; sign into your online account, select Most Valuable Kids of Greater Cincinnati (#ND772) and help us create even more opportunities for deserving kids in our community simply by shopping at Kroger. 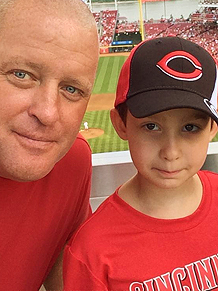 Daniel attended his first baseball game with his mentor Chris from the Big Brother Big Sister of Greater Cincinnati. What's your greatest joy while attending a baseball game? It sounds like Daniel enjoyed being on the Jumbotron! They sound like a great match!